as i have often reiterated in these pixels, the luxury of a short walk to the office each day is mine for the taking. no need to release any bicycle from thewashingmachinepost bikeshed, for that would likely take longer than the walk. therefore in the weeks prior to and just after the shortest day of the year, the too-ing and fro-ing in the hours of darkness were, from a personal point of view, unilluminated. the villages on islay are relatively small (something of a tautological statement there), and oft times feature street-lighting along one side of the road only. this is perfectly adequate for our needs, and in the absence of any public transport after the hour of 6pm, there is no need to even stand in a darkened bus shelter. the working day is often longer than office hours would dictate, but since the bulk of my efforts require little more than a trackpad, wacom tablet and a computer, any evening work can be calmly and comfortably carried out in the confines of my own home. i have yet to resort to uploading and downloading from the cloud, but any work carried out from the armchair is generally available from some sort of portable storage. aren't i one of the lucky ones? there is, therefore, no need generally to be out on a bicycle during the hours of darkness, something which would surely have me classified as a commuter of one type or another. this is not to say that i do not attend evening events, but such is my unwillingness to expose self and bicycle to the vicissitudes of the boy racers who find it a satisfactory definer of manhood to cut blind corners at excessive speed, that there is a distinct limit to how far i am willing to travel on two wheels after dark. however, in the late part of last year and the months currently inhabited in 2012, the difference between light and dark can often be measured in minutes, and since the best laid plans often have minds of their own, it ill behoves the conscientious cyclist to be caught out bereft of appropriate illumination. 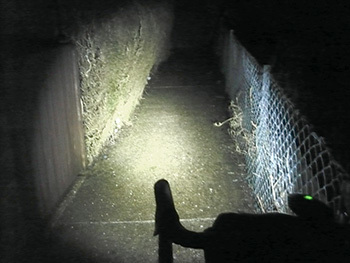 the iniquitous part of the equation can be often measured in candlepower, lumens or simply downright brightness of lighting, for it seems an incontrovertible truth that motorists are either reluctant to dip headlights for a mere velocipede, or they simply do not cotton on to our existence until too late. this is presumably because that which is affixed to the bars is sufficient for the purposes of navigation, but insufficient to engender temporary irritation to the retina. thus bicycle lighting must exist on two spearate planes; that of enabling appropriate luminescence and a strong enough beam that oncoming traffic will mistakenly assume they have wandered onto the main runway at heathrow. the third factor would surely concern that of pragmatism; those searchlights used by search and rescue helicopters would be ideal were it not for the fact that they need a helicopter on which to mount them. thus the simple demands of the peletonese require that such unlimited power be encapsulated in a compact and bijou casing, capable of being easily unclipped and stuffed in a pocket to avoid unwarranted removal during the hours of unattendance. after all the foregoing, it will surprise you little to learn that i may have found the ideal candidate for the job. 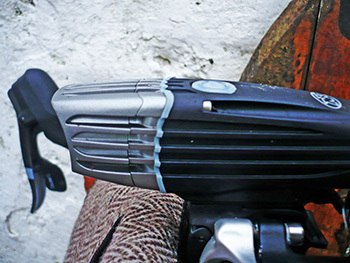 the whimsically named minewt 600 is in possession of, as the name suggests, a maximum of 600 lumens. believe me, that is easily enough to make you blink. its size and weight are a mere nothing, and though its styling is very 1950s dan dare, it slots onto its easily mounted bar bracket and is operable by a glowing green button on the top. the minewt's versatility does not, however, end there, for in the best of traditions, there are options to be merciful to those hapless motorists. press that glowing button a couple of times and the light subtly dips first to 400 lumens and subsequently to 275, in each case lenghthening the battery life. i have not yet had cause to test the figures supplied by nightrider, but apparently 1.3 hours can be expected for the highest setting before recharging is required. to extend battery life to its maximum, it is a simple matter of holding the button for a few seconds, during which the light switches off completely before moving into flash mode, ideal if you simply wish to be seen rather than to see. the only criticism i may have, and the minewt is not alone in this failing, is a lack of lateral adjustment on the bar bracket. many of islay's roads simply ameliorate into grassy fields, many populated by wandering cows and sheep. it is of great assistance to allow positioning of the light pointing towards the edge of the road to distinguish tarmac from grass and to catch the eye of itinerant cattle before they step in front of the moving bicycle. granted, this is not a problem that will afflict many of the light's purchasers, but it would surely be a simple undertaking to allow the top of the bar bracket to swivel slightly from side to side. the minewt comes with pretty much every accessory conceivable: the bar bracket, a helmet bracket, and a cable and mains plug to recharge the internal lithium ion battery. the recharge socket is a mini usb, so it is possible to recharge the light from a computer, should such prove desirable or necessary. 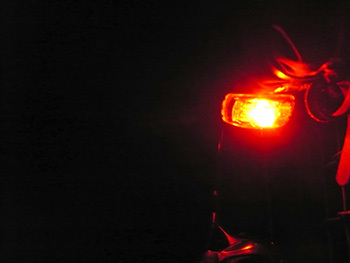 legally, riding after dark not only demands some form of forward illumination, but a matching red light at the rear. in vitamin d challenged grey days such as pervades much of the current daylight hours, it is often a salient idea to mount a rear flashing red light even in daytime, simply to advertise one's existence to the hordes of approaching traffic (or not so many hordes in my case). 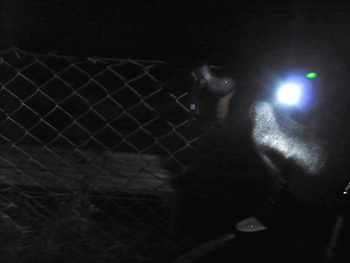 to fulfil both obligations, the minewt headlamp was matched with a nightrider cherry bomb presumably so-named for both its colour and degree of brightness. powered by two aaa batteries, the one watt led astonishingly belies its minimal power output by engendering headaches after only a brief period of close observation. the very thing of which unsubtle identification is made. the mounting bracket which clamps round the seatpost allows movement both vertically and rotationally (so why can't we have that at the front? ), making it a simple job to position the cherry bomb under a seatpack and still allow a clear view of its brightness. 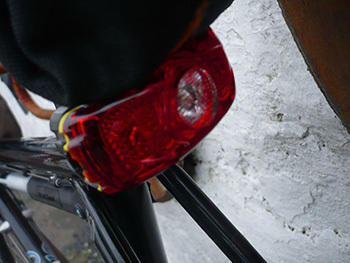 this tail-light has only two modes: flashing and steady, the former giving battery times of up to 100 hours, easily enough for one winter of greenwich meantime. so while i hope to continue my period of home-safety and comfort of a dark evening, should the circumstances demand it, my path along islay's highways and byways ought to be easily visible from the international space station. the nightrider minewt 600 cordless retails at £134 while its cherry bomb partner costs £19.99 for the 0.5 watt version and £24.99 for the one watt. 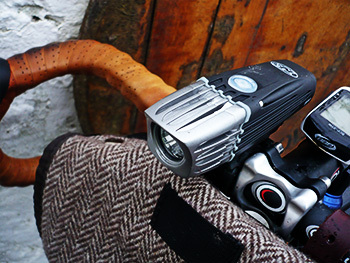 nightrider lights are distributed in the uk by edinburgh's 2pure. please note that the top photo is merely for illustration; my camera simply could not record the full power of the minewt 600 which illuminated a tad more than the photo shows.